Wow, March was an eventful month at ‘Ulu‘ulu! Many students, filmmakers, and others from the community came to visit us for our March events, some also dropped by for tours. We were especially happy to welcome the family of Henry Ku’ualoha Giugni (our namesake) earlier in the month! Interisland Terminal’s Nerd Spring Break, which featured documentary films to keep our brains in gear during the break. Our staff edited archival footage from Videololo, Joan Lander, Victoria Keith and the UH Manoa Student Video and Filmmakers Association into a program called “From ‘Ulu‘ulu’s Vault : Development, Transportation & Time Capsules.” Event attendees enjoyed the showing and entered an interactive Q&A with Head Archivist Janel Quirante. Celebrating Hōkūleʻa, a series of talk story events and a pā‘ina celebration at UH West Oʻahu honoring the 40th anniversary of Hōkūleʻa’s first launch. About 50-60 faculty, students, and community members joined us each day to learn about Hōkūleʻa’s legacy and the current Mālama Honua WorldWide Voyage. Mahalo to our guest speakers: Keoni Lee (Oiwi TV); Hōkūleʻa crewmembers Kaina Holomalia, Austin Kino, Darienne Dey & Tamiko Fernelius; Elisa Yadao & Cliff Watson. View more photos on our flickr https://flic.kr/s/aHsk9tnkCj. Oki ka piko, the blessing of UH West Oʻahu’s new Hale Hālāwai. Roselani Media Preservation Internship, we were excited to receive applications from students in and beyond Hawaiʻi who are interested in interning here at ‘Ulu‘ulu this summer. We’re currently in the selection process… wish we could choose more than one! Mahalo to all who visited with us in March! Looking forward to what April has in store for ʻUluʻulu! As a reminder, our collections will be closed April 1 – June 30, 2015 while our vault undergoes a much-needed mobile shelving installation. Our catalog and digitized collection items will remain open and accessible during this time. Feel free to contact us with any questions. Today marks the 40th anniversary of Hōkūleʻa’s first launch! Hōkūleʻa helped Hawai’i to embark on a journey of cultural awakening – not just for our voyaging traditions but for our native language and for the many cultural practices that continue to be perpetuated today. Designed by artist Herb Kawainui Kane and built by the Polynesian Voyaging Society (PVS), the double-hull canoe was built to replicate a traditional Polynesian voyaging canoe. Hōkūleʻa’s first launch took place at Kualoa, Oʻahu on March 8, 1975. About a year later, Hōkūleʻa departed Maui for Tahiti on a historic voyage that successfully demonstrated traditional navigation techniques and proved that Polynesians purposefully voyaged long-distances (and did not accidentally settle the Pacific). With each of the voyages since 1976, Hōkūleʻa continues to inspire people throughout the Pacific and around the world (see our Hōkūleʻa theme page for historic footage of past voyages and crew members). She and her crew are currently on a voyage around the world with a mission of Mālama Honua (caring for our island earth). 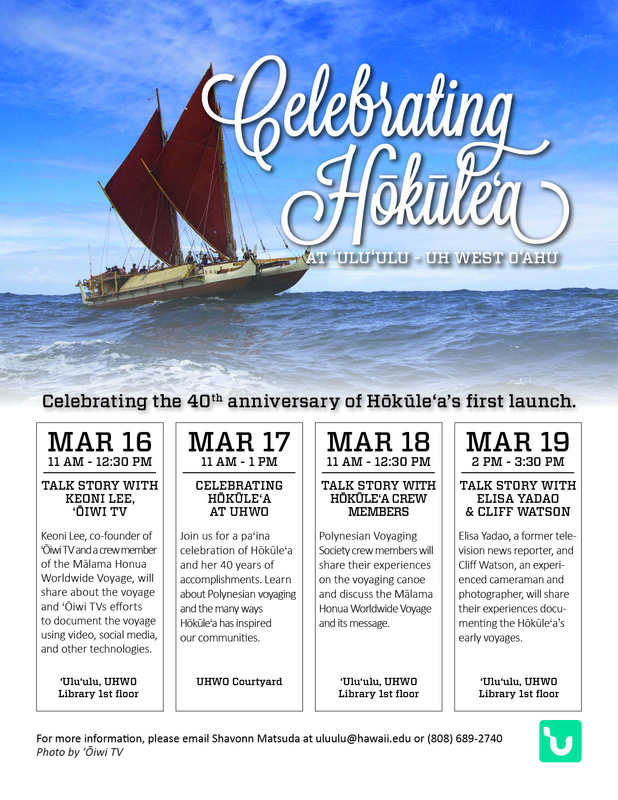 To celebrate Hōkūleʻa’s 40 years of accomplishments and to promote the mission of the Mālama Honua World Wide Voyage, ʻUluʻulu will be hosting a talk story series and a pā‘ina celebration at UH West Oʻahu March 16-19. All events are open to the public, we hope you will be able to join us! Keoni Lee, co-founder of ‘Ōiwi TV and a crew member of the Hōkūleʻa Mālama Honua Worldwide Voyage, will discuss the voyage and ‘Ōiwi TV’s efforts to document the journey using video, social media and other technologies. He will also discuss the importance of sharing Hōkūleʻa’s story with Hawai‘i and the world. All are invited to a pā‘ina celebration of Hōkūleʻa and her 40 years of accomplishments. Come learn about Polynesian voyaging and the many ways Hōkūleʻa has inspired people around the world. Enjoy music and light refreshments. Polynesian Voyaging Society crew members will share their experiences aboard the voyaging canoe and discuss the Mālama Honua Worldwide Voyage and its message. Former television reporter Elisa Yadao and experienced camera man Cliff Watson will share their experiences documenting Hōkūleʻa’s early voyages. Both Elisa and Cliff traveled to Tahiti to record Hōkūleʻa’s arrival during the Voyage of Rediscovery (1985-87) and also covered her journey to the Cook Islands and to New Zealand as well as the nearly month long 2,800 mile sail back to Hawai‘i. Keoni Lee is the Co-Founder of ‘Ōiwi TV, the first Native Hawaiian owned and operated television station. Founded in 2009, ʻŌiwi TV is a social enterprise that aims to create meaningful impact for Native Hawaiians and Hawaiʻi by re-establishing the Hawaiian language and worldview in daily life through media. Keoni’s focus at ʻŌiwi TV has been on digital convergence and leveraging new technologies to create a new model for community-based media in the digital age. Polynesian Voyaging Society (PVS) seeks to perpetuate the art and science of traditional Polynesian voyaging and the spirit of exploration through experiential educational programs that inspire students and their communities to respect and care for themselves and each other, and their natural and cultural environments. Established in 1973, PVS’s first project was to construct a replica of an ancient voyaging canoe – on March 8, 1975 Hōkūleʻa was built. Cliff Watson was the videographer on the voyage of Hōkūleʻa from 1985 to 1987. He has more than 30 years experience as both a still photographer and a broadcast cameraman and has worked for local and national news organizations, PBS Hawaii and on independent documentaries. In 1989 he launched his own video production company CDW Productions. Today he works at UH System Media Production. Elisa Yadao began her career at KGMB News where she reported on Hōkūleʻa’s journey of rediscovery. She and cameraman Cliff Watson sailed with the crew from Hawai‘i to Tahiti in 1985. Today, Elisa is senior vice president of HMSA’s Consumer Experience division. Her past experience included the position of chief information officer for the City and County of Honolulu’s rail transit system, a private communications consultant, executive director of the Polynesian Voyaging Society, managing editor of KHNL news and a television reporter for KGMB TV News. For more information about these events or how your organization might participate, please contact Shavonn Matsuda at uluulu@hawaii.edu or (808)689-2740. On January 24th, Shavonn and Koa participated in the first installment of the Kahuku Public and School Library’s Hawaiian Digital Resource Series. We shared about the work that we do in the archive and showed samples of the treasures we come across every day. Tamara Martinez, a librarian at the library, had the idea for the series when she was helping a patron do land research. She wanted to showcase the many digital resources that we have available to our communities – resources that are free and accessible remotely. At our visit to the library, we held two information sessions and we were happy to see that both were well attended by students, kupuna, and other Kahuku community members. During the sessions, we had fun watching the reactions of the crowd as they enjoyed various clips highlighting the different types of content we care for at the archive. Their reactions were mostly just amazement at seeing the moving images but we could also hear them commenting to each other every now and then as they recalled the familiar faces and places shown in the videos. Those in attendance helped it to be lively sessions! They had lots of great questions about preservation and about how they can access and use ‘Ulu‘ulu’s collections for curriculum and for their families. Overall, it was a great opportunity to share what we do and the treasures we collect and make accessible here at the archive. Mahalo Kahuku! We deeply appreciate opportunities like this to get the word out about ‘Ulu‘ulu. If you’d like to have us do an information session to share about ‘Ulu‘ulu in your community, please don’t hesitate to contact us. Contact Tamara Martinez (tamara.martinez@librarieshawaii.org) or call the library at 293-8935 for more information about the series. In celebration of libraries and archives Preservation Week, ‘Ulu‘ulu held an Open House this past Wednesday. The event was one of many held around the country this week to highlight what we can do to preserve the collections held and loved by our communities. During the event, our ‘Ulu‘ulu staff shared preservation tips with those who stopped by our table at the front of the UHWO Library and gave tours of the archive to students and staff. 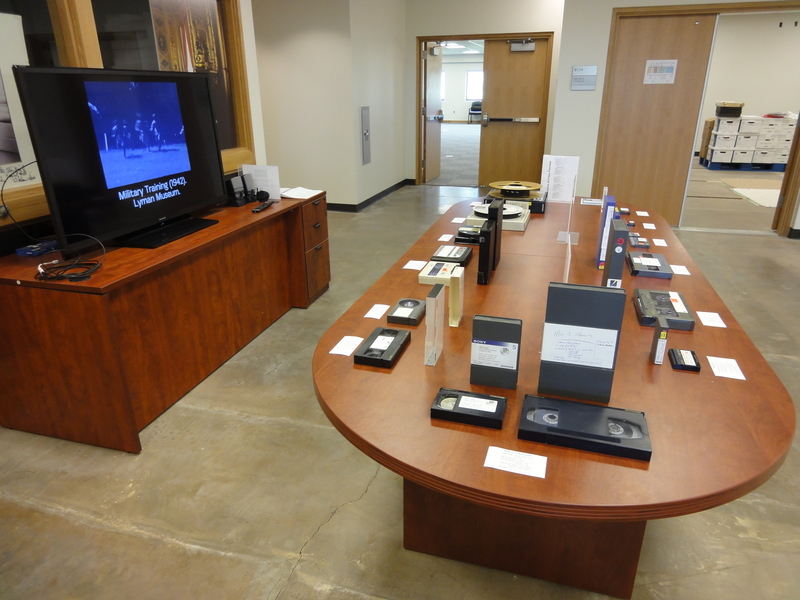 We also displayed a timeline of videotapes to showcase the variety of videotape formats in our collection, from 2” Quads to DVCPro; for some, it was their first time seeing reels of videotape. In order to encourage others to preserve their personal collections, we especially highlighted the types of videotapes that are most common in our own homes – formats like VHS and MiniDVs. Mahalo to the UHWO Library and to all those who visited us during the Open House. 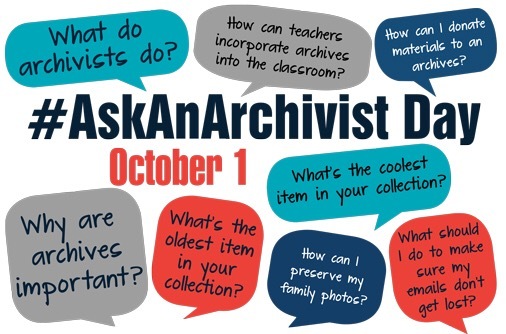 Happy Preservation Week and Happy Aloha Friday! Check out the UHWO Flickr album for more photos. For info on Preservation Week, please visit www.ala.org/preservationweek. The Worldwide Voyage of Hōkūleʻa and Hikianalia is scheduled to depart Oʻahu for Hilo on May 17th, weather permitting. From Hilo, the sister canoes will sail to Tahiti, and begin their international journey. Educators from around the island attended yesterday’s WWV Educational Summit which was led by crew members Jenna Ishii, Patricia Halagao and Miki Tomita. ʻUluʻulu is proud & honored to play a role in supporting the education effort of this very important voyage. We were invited to introduce our Theme Page to educators who will be creating curriculum and connecting with the crew via satellite. Connect to www.hokulea.org and follow the plan for Mālama Honua through 2017!